You are currently browsing the The Pet Product Guru blog archives for the day Friday, February 1st, 2019. Don’t Be Afraid to Push Back! Many years ago, my roommate at the time had cat name Hitler because he had a white facte with a little black around his nose. It was Christmas time and Hitler became very lethargic and stopped eating or doing anything. My roommate and I were very concerned. We took Hitler to the vet who gave us the bad news. Hitler ate the tinsel on the tree and it was strangling his intestines. He advised us to euthanize Hitler. My roommate didn’t have the heart to do this so we took Hitler home. Since my roommate was headed to Minnesota for the Christmas holiday, I did everything I could to nurse Hitler back to health. I spend hours with an eyedropper giving him water. Hitler was apparently very dehydrated. I kept giving him water, then broke up some roasted turkey, put in on a napkin. To my amazement he began eating a little of the turkey. He began to take in more and more water and more and more turkey. After about three days, Hitler was up and around. When my roommate came home, he came through the door and found Hitler darting all over the apartment. I posted this next segment yesterday and I strongly feel that it also applies to Veterinarians. Remember they work for you PUSH BACK!!! Over the past couple of years, several people that I’m close to have been dealing with the “dreaded” cancer. The following is my opinion on this subject. First of all let me say that even though much progress has been made in dealing this this awful disease, I still think we should be much further along. There should be a more humane way to control and cure this monster. Being older, I pause and say “Is there anything on this good earth that can cure this? Is there anything that can effectively maintain a patients lifestyle while treating the “cloud of cancer?” I think there may be but I’m not going into any conspiracy theories or anything. I want to emphasize the importance of taking control. Remember, your doctor/doctors work for you. In the past it seems as if patients regularly accepted whatever the doctor said, no questions asked. In the case of cancer some received debilitating surgeries and Chemotherapy without even discussing any other options. My own mother feared treatments so much that when she received very concerning news about her condition, she chose to do absolutely nothing! This was very concerning for us but mom made her own decisions. I feel that every patient has the right to question their doctor. Question again and again until you receive answers that you’re satisfied with. If necessary, seek second or third opinions. There is someone very close to me who is going through this right now. My friend seems to have a good doctor but sometimes he changes the course of treatment. I’ve been helping my friend write down questions about the treatment prescribed. After we speak which is on a regular basis, I do some research, then come up with more questions. My friend writes them down and presents them to the doctor. The diagnosis of cancer can be so overwhelming that at the time, patients don’t know where to turn, or what to ask. Remember, you can PUSH BACK and PUSH BACK again until you are satisfied with the plan ahead. These are your rights as a patient! 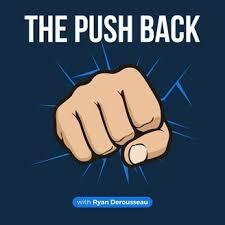 Remember PUSH BACK!!!!!! The oldies are playing all the time on Edgewater Gold Radio! It’s a 60s and 70s weekend beginning tonight at midnight! Ask Alexa to “play Edgewater Gold Radio or listen from our website: Edgewatergoldradio.com. add comment Comments Off on Don’t Be Afraid to Push Back!